Olive Garden is one of my favorite restaurants, but frankly, I hate the cost. 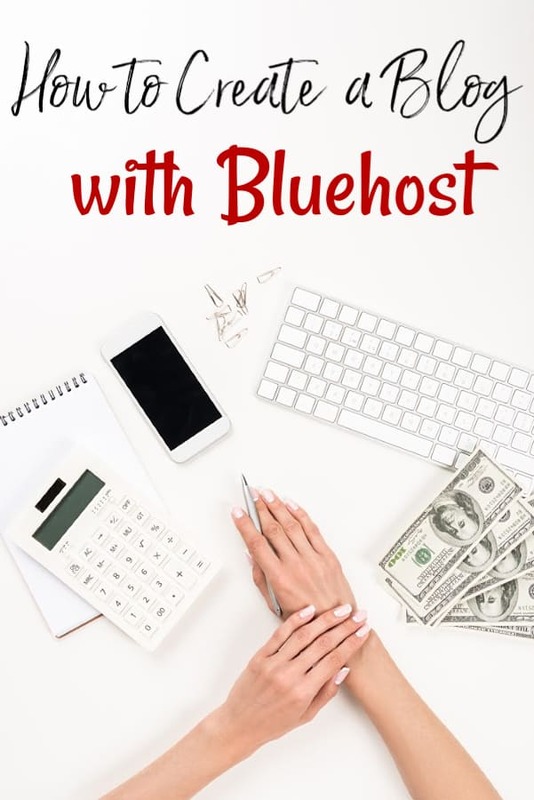 Sure, I do everything I can to save money when eating out and to earn free Olive Garden gift cards online, but it can still be pretty expensive if you head over there too often. I could eat Olive Garden several times a week because there’s so much to love! One of my favorite dishes from them is Olive Garden’s Chicken Gnocchi Soup. If you’ve never had it, I highly suggest you try it! It’s great! Lucky for you though, you don’t need to head to Olive Garden to try it! This copycat Olive Garden Gnocchi Soup recipe is spot on! It’s my 2nd favorite Copycat Olive Garden recipe only falling 2nd to my all-time favorite, my Copycat Olive Garden Chicken Fettuccine Alfredo recipe. First, let’s be clear on what gnocchi is made of. A lot of people mistake it as a pasta, but it isn’t. Gnocchi is made from a few different things, but most notably potatoes, wheat flour, breadcrumbs, egg and so on. 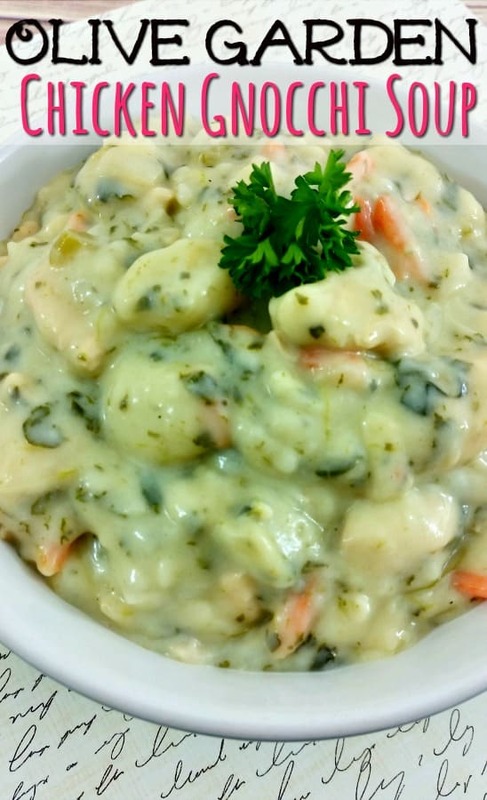 In our copycat Olive Garden chicken gnocchi soup – and in the “real” thing – potato gnocchi is used. Gnocchi can be flavored with everything from herbs to chocolate and even prunes. Not sure how I’d feel about prunes, but who am I to judge? 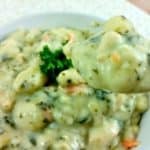 You can buy your gnocchi premade and for this recipe, that’s what we have done, but if you would like to learn how to make homemade gnocchi, Food Nouveau has a great tutorial with video that can help. If you do decide to make your own, you’ll probably want to pick up a gnocchi board and paddle. Once you try this, I’m positive you’ll add it to your list of tried and true copycat Olive Garden recipes. It’s so good and so close to the real thing that you’re going to want to make it again and again. For me, it has become one of my favorite go-to meals when I want something comforting and fairly simple to make. 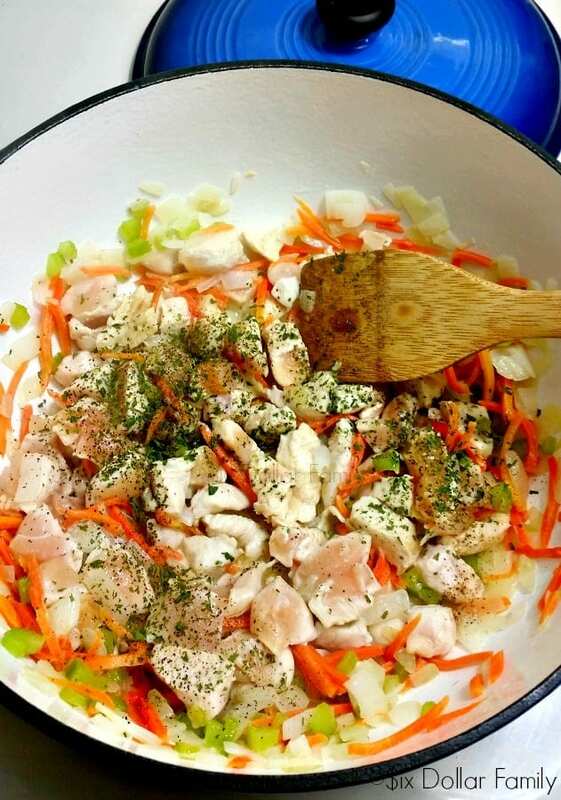 It’s one of my favorite recipes to use my Zaycon chicken breast order for because their farm fresh chicken really makes it taste so much better than with store bought chicken. Call me strange, but I can taste the difference. In a large heavy bottom stockpot, heat the olive oil and butter until the butter is fully melted. 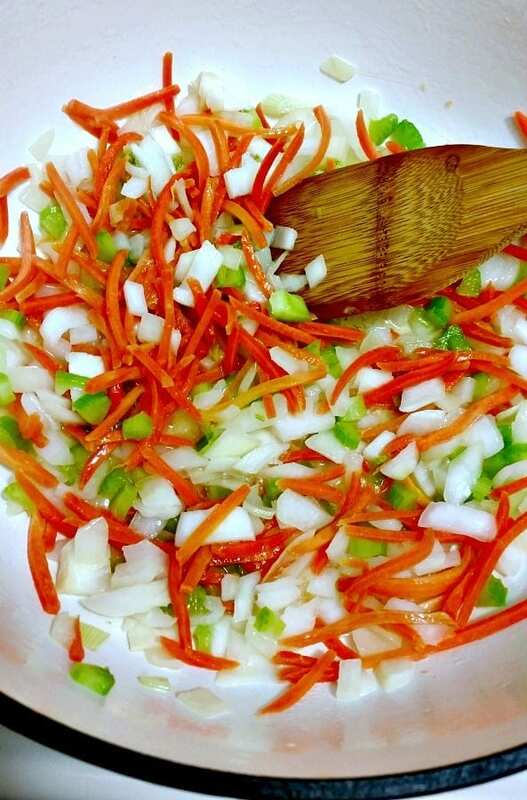 Add the onion, celery, and carrot to the pot and sauté for 3-5 minutes or until the onions are translucent. Next, add the chicken breast and cook thoroughly. If you’re unsure if the chicken is done, use a meat thermometer to double check. This is the main cooking time for the chicken and once you pass this step, your copycat Olive Garden chicken gnocchi soup will only cook for another 12-14 minutes so be sure it gets fully cooked here to be safe. Once the chicken is cooked through, add the minced garlic, thyme, and rosemary. 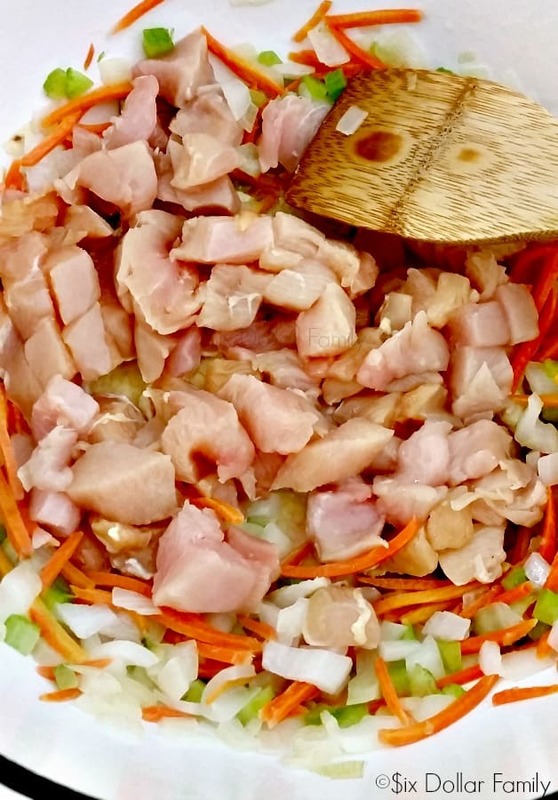 Stir well and sauté for another 2-3 minutes. After you’ve sautéed the vegetable/chicken mixture, sprinkle the flour over top of them and stir well. The flour helps to create a roux which will ultimately thicken your copycat Olive Garden chicken gnocchi soup. Next, add the wine, spinach, and chicken broth, stir well and bring to a boil uncovered. If you don’t use wine when cooking (like me), substitute chicken broth or white grape juice. Just keep in mind that grape juice will give your soup a bit more of a sweet flavor. I personally opt for chicken broth. Finally, add the gnocchi and boil for 12 minutes making sure to stir it often. Once the pasta is done, lower your heat to a simmer and add the heavy cream. Stir well (and often!) and simmer until it has thickened. Once it has thickened, garnish with fresh parsley and serve your copycat Olive Garden chicken gnocchi soup hot with breadsticks and a salad. That’s it! 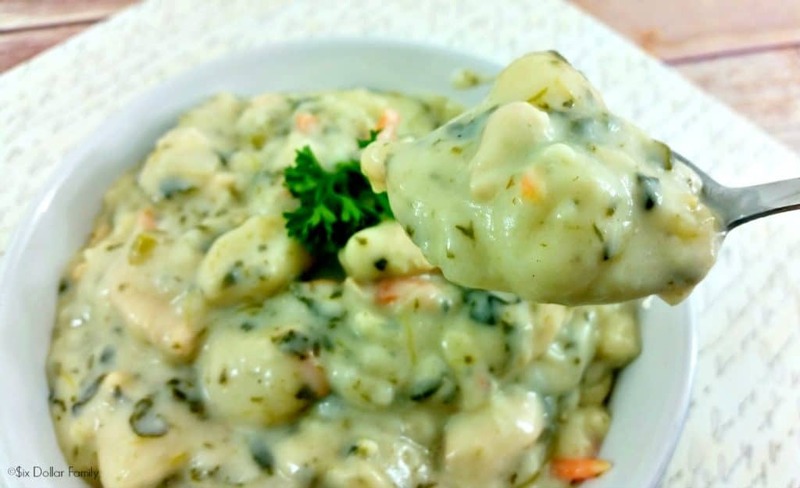 If your Copycat Olive Garden Chicken gnocchi soup doesn’t thicken to your liking, you can make a thickener by mixing flour or cornstarch and cold water together until it resembles pancake batter. Add this mixture to your boiling water and stir. It should thicken the soup to your liking. Love Copycat Olive Garden Recipes? You'll ADORE this one! This Copycat Olive Garden Chicken Gnocchi Soup Recipe is perfection in a bowl! Next, add the chicken breast and cook thoroughly. Once the chicken is cooked through, add the minced garlic, thyme, and rosemary. Stir well and sauté for another 2-3 minutes. After you’ve sautéed the vegetable/chicken mixture, sprinkle the flour over top of them and stir well. Next, add the wine, spinach, and chicken broth, stir well and bring to a boil uncovered. If you don’t use wine when cooking, substitute chicken broth or white grape juice. Finally, add the gnocchi and boil for 12 minutes making sure to stir it often. Once the pasta is done, lower your heat to a simmer and add the heavy cream. Stir well (and often!) and simmer until it has thickened. 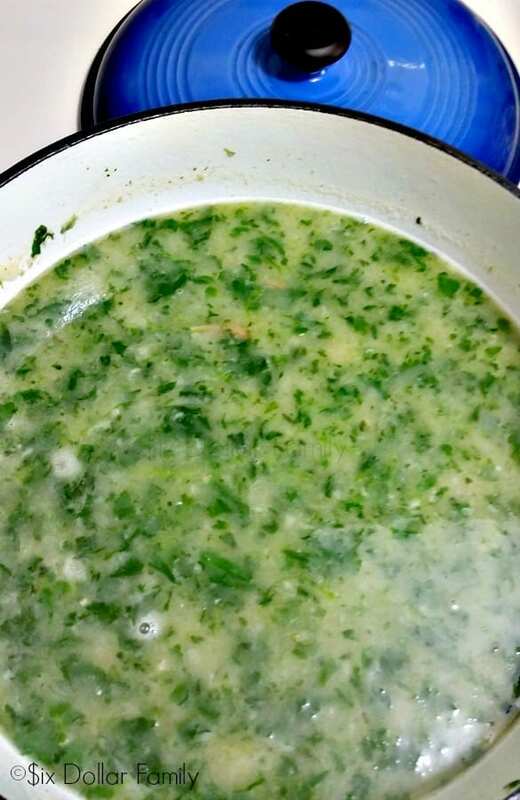 Once it has thickened, garnish with fresh parsley and serve. 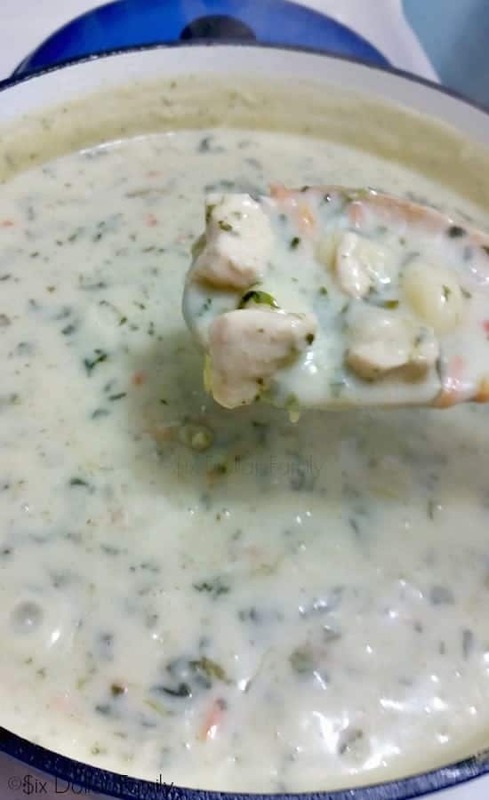 If your Copycat Olive Garden Chicken gnocchi soup doesn’t thicken to your liking, you can make a thickener by mixing flour or cornstarch and cold water together until it resembles pancake batter. Add this mixture to your boiling water and stir. It should thicken the soup to your liking. If you substitute white grape juice for the white wine, keep in mind that grape juice will give your soup a bit more of a sweet flavor.